JULY 2016 NEWSLETER » Wagon Tongue CO.
Well it’s been a while since the last Members to Members Newsletter, not to be confused with the official WTRC newsletter. But there is something that really needs to be addressed. In the last couple WTRC newsletters we learned that many homes and cabins were broken into and that lots of high dollar items had been stolen as tools, big screen TV’s and so much more. What was not mentioned was how many places were broken into. According to Dennis Kost who is a member of the board and also lives here, it was 18 break-ins that we know of. He told me there could have been more we don’t know about. This number of break-ins has never happened before in the history of Wagon Tongue! There was a time when we had no break-ins at all! But then gradually, there would be one or two. This was usually during the winter months but some during the warmer months as well. So then was established a Neighborhood Watch. It worked well! But now it has been stopped. There are still a few old signs and window stickers around but that’s about it. Let it be clear, we have no Home Owner’s Association. What does this mean? It means simply this: The Board of Directors have no authority over security up here unless it has to do with the lakes. This also means as members of the club who live up here are on our own! During the time of the break-ins one night, I was laying on my bed when I heard my golden retriever bark once. He doesn’t usually bark unless he’s supposed to. A couple minutes later, I heard a man saying just outside my bedroom window, “ARE YOU READY?” My guess was that one man was asking his accomplice if he was ready to come storming in for another break-in. I jumped off my bed and went for my gun but by then, apparently they saw my dog on the porch and realized someone was living in this cabin so they took off! Those who did all those break-ins never broke into a place where they believed there was someone living there. Those guys are gone now but it’s just a matter of time until there will be more and this next time they may break in even knowing you’re in your cabin. You need to have at least one gun handy and know how to use it! You should also have many motion detecting lights and security alarms. Although I have all this, they were going to break in any way! Colorado has a (MAKE MY DAY LAW) this means if someone breaks into your cabin with you in it, you can shoot them. No questions asked! So it’s always good to also be insured by Mr. Smith & Mr. Wesson. Wagon Tongue has become a paradise lost! I knew this was going to happen eventually but now it’s here. A couple years ago I suggested we put up a gate at the entrance to be left open unless things got really crazy in which case we could close and lock it. Every member could be given a key or combination to the lock. It never happened. It should have. I was told by one board member, Lester Williams, that gates are put up to keep the good guys out. That’s nonsense! All 18 break-ins took place in this section of Wagon Tongue. If you live here full or part time and want to get something done, contact me and I’ll get you with likeminded neighbors. There’s not that many of us living up here so we need to pull together now! And don’t go thinking someone else will do this because they’re thinking the same thing as you are. Call me, (Jim) at 748- 6003 or email me at cultbuster7@yahoo.com P.S. If you would like to do a night security slow drive through Wagon Tongue each night, I’ll give you my high intensity spotlight to shine around all the properties up here each night. Be sure to bring up our lack of security problem at our General Membership/Election Meeting and Pot Luck this Saturday July 9th . Beginning at 11:00 a.m.
A Fishing Line That Casts Much Further! Have you ever had to replace the line on your reel but it doesn’t cast very far because the line is acting like curly fries? One time after buying some new line I actually went to the extreme of wrapping it around my cabin a couple times and leaving it there a few days to get it to stay straight. That worked but I recently found a line that comes out as straight as straight can be! It’s called Trilene by Berkley. I found it at Wal-Mart. You might want to get some. Give a man a fish and he will eat for a day. Teach a man to fish at Wagon Tongue and his wife may never see him again. I’ve added a couple new boats for members to use, a bright orange kayak and another yellow kayak for kids. Max weight 135 lbs. Both have paddles. I still have 5 other boats available for members to use. A blue john boat, a sun-bleached red canoe (with two new paddles), two other bright yellow kayaks and two blue & white peddle boats. That makes 7 and I think that should do us well enough! All are marked (FREE USE) and with my name on them. (Jim Zilonka) Please don’t use any boats not marked (FREE USE) These are privately owned. One weekend recently, I found some people about to use a couple privately owned boats. If someone is caught doing this, we take them deep into the forest, tie them to a tree and pour honey all over them. We call this bear law. There have been no repeat offenders! When borrowing one of these boats, always return it to where you found it and always be sure to have life jackets (not provided) Thanks! For those of you who want to look into RC boats for fishing you can simply go to www.RcFishingWorld.com or call Fish Fun at: 1-734-502-8796. And get this! If you film this boat catching a fish, make a YouTube and post it on line and send it to the company, they will send you another RC fishing boat for free! I’ve been using one of these to chase our pelicans away. They eat way too many fish and at about $5.00 a pop, we can’t afford to keep feeding these birds. These boats are 34 inches long and move pretty fast and their new model has variable speed so you can use it for trolling! These boats cost about $100.00 and are well worth it! You don’t need to wait until we have no power, these are great to use all the time! A friend of mine talked me into getting one years ago. It arrived in January when it was bitter cold and snow on my deck but I wanted to try it anyway so I pointed it toward the Sun and stuck in a frozen lasagna. It was like a brick of ice! I came back in my cabin for an hour, went out to check on it and it was already done! I’ve cooked all kinds of stuff in this thing. I’ve even baked bread! The foods seem to taste better too because they cook a little slower plus it doesn’t cost anything to operate. You can purchase these from several venders but this one seems to have the best price I’ve found. ($261.15): 866- 786-7763. 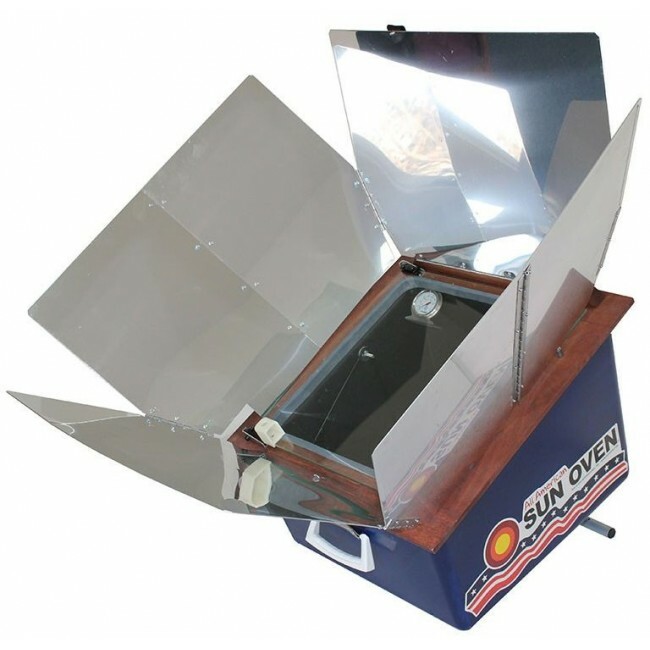 It’s called The Sun Oven. If you want to see mine first, just give me a call. There have been a few trespassers/poachers but not as bad as last year. Most came as soon as the ice melted but less now. All we need is a presence known. Anyone can and should be doing lake patrol. If you see someone fishing either without a badge or with only a guest badge saying we’re with so and so but so and so is not with them, they need to be questioned and if they are family of a member and have paid for a membership, they need to show proof as such. If they can’t, you have full authority to ask for their badge. This is according to the Park County Sherriff. I recently bought the property just above mine and installed an 18 hole Frisbee golf course. Also works as a mini golf course. I have tons of Frisbees, golf balls and about 5 golf clubs you can use. Nothing fancy, just 18 holes in the ground with dog food cans in them. Each hole has a fiberglass rod by it with a bright orange flag. It’s hard to miss all these orange flags when driving by. It’s the property just up from 254 Lariat Dr. There’s a new driveway onto to park anywhere or on the road. I also had part of the property leveled and put in a swimming pool! We’ve already had some hot days and we’re sure to have some more this summer! The pool gets it’s warmest about 2:00 p.m. I thought I’d open this up for all members this year. Bring something to swim in and towels. No bathroom available but there’s a forest nearby. There’s also free kites for kids of all ages and plenty of room for flying RC planes, quadcopters etc. Also want to put in a half acre long slip-n-slide, a zip-line and more but need help to do it. IMPORTANT! No need to come to my door, all the equipment is in the greenhouse near the pool and please always, always call before coming over. 748-6003. If wishing to come in the morning, call me the day or night before. I often work on my radio broadcast until the wee hours of the morning and usually not available until the afternoon.